Began working with one of my favorite models on some portrait work. It's been great fun thus far. The summer semester at the Art Academy will be starting soon and I'm adding some painting classes to the mix. It's been quite a while since I've done any considerable amount of painting, so I'm very much looking forward to returning to this medium. Plus, I'll finally be working on other subjects besides the human figure. Perhaps some pretty vases. 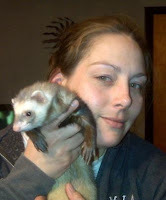 Eva and Francine the Ferret. 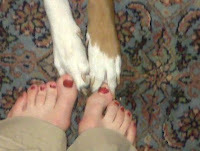 Bailey and I were attempting to play toe war. What a beautiful day it is! 75 degrees and breezy. The sun is shinning and the birds are chirping. What more can I say? Tonight, the luxury of having a professional male model. 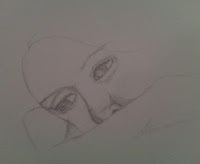 After a very long, exhausting day at work, it was quite nice to have a very wonderful session of drawing. I did not want it to stop. And even better, Spring is really here.